It is certain that the present time is a time of much suffering. One example that we have discussed very much on our blog has, of course, been the recent tragic natural disasters, the latest now being the great earthquakes in Italy. As we know, however, the greatest example of suffering relevant to all good Catholics today is the great moral degradation of the world and the crisis of Faith in the Church. Everyone must also handle all of the little crosses that come our way every single day in this “vale of tears”. Does this mean that we Catholics should put on a long face and mope around and complain that, “Oh, how things used to be so much better!”? By no means! As Fr. Paul O’Sullivan explains, God allows us to experience these sufferings that we may share a part in His Passion and be strengthened in Love! By accepting God’s will in our trials, we will win the most glorious and beautiful crown of martyrdom! I post the full article by Fr. O’Sullivan below. May it be of much edification to our readers! by Fr. Paul O’Sullivan, O.P. Suffering is the great problem of human life. We all have to suffer. Sometimes small sorrows, sometimes greater ones fall to our share. We shall now tell our readers how to avoid much of this suffering, how to lessen all suffering and how to derive great benefits from every suffering we may have to bear. The reason why suffering appears so hard is that, first of all, we are not taught what suffering is. Secondly, we are not taught how to bear it. Thirdly, we are not taught the priceless value of suffering. This is due to the incomprehensible neglect on the part of our teachers. It is surprising how easily some people bear great sufferings; whereas, others get excited even at the smallest trouble. The simple reason is that some have been taught all about suffering; others have not. First of all, then, suffering is not simply an evil, for no one suffered more than the Son of God Himself, more than His Blessed Mother or more than the Saints. Every suffering comes from God. It may appear to come to us by chance or accident or from someone else, but in reality, every suffering comes to us from God. Nothing happens to us without His wish or permission. Not even a hair falls from our heads without His consent. Why does God allow us to suffer? Simply because He is asking us to take a little share in His Passion. What appears to come by chance or from someone else always comes because God allows it. Every act in Our Lord’s Life was a lesson for us. The greatest act in His life was His Passion. This, then, is the greatest lesson for us. It teaches us that we too must suffer. God suffered all the dreadful pains of His Passion for each one of us. How can we refuse to suffer a little for love of Him? Secondly, if we accept the suffering He sends us and offer them in union with His sufferings, we receive the greatest rewards. Five minutes’ suffering borne for love of Jesus is of greater value to us than years and years of pleasure and joy. The Saints tell us that if we patiently bear our sufferings, we merit the crown of martyrdom. Moreover, suffering borne patiently brings out all that is good in us. Those who have suffered are usually the most charming people. If we bear these facts clearly in mind, it certainly becomes much easier to suffer. Thirdly, when God gives us any suffering, He always gives us strength to bear it, if we only ask Him. Many, instead of asking for His help, get excited and revolt. It is this excitement and impatience that really make suffering hard to bear. Consider that we are now speaking of all suffering, even the most trifling ones. All of us have little troubles, pains, disappointments, every day of our lives. All these, if borne for love of God, obtain for us, as we have said, the greatest rewards. Even the greater sufferings that may fall to our share from time to time become easy to bear if we accept them with serenity and patience. What really makes suffering difficult to bear is our own impatience, our revolt, our refusal to accept it. This irritation increases our sufferings a hundred fold and, besides, robs us of all the merit we could have gained thereby. We see some people pass through a tempest of suffering with the greatest calm and serenity; whereas, others get irritated at the slightest annoyance or disappointment. We can all learn this calm and patience. It is the secret of happiness. An eminent physician, in a conference which he gave to distinguished scientists and fellow doctors, told them that he owed all his great success in life to the simple fact that he had corrected his habit of impatience and annoyance, which had been destroying all his energy and activity. Everyone, we repeat, without exception, can learn this calm and serenity. We must all do penance for our sins. If we do not, we shall have long years of suffering in the awful fires of Purgatory. This fire is just the same as the fire of Hell. Now, if we offer our sufferings the very little ones as well as the greater ones-in union with the sufferings of Jesus Christ, we are doing the easiest and best penance we can perform. We may thus deliver ourselves entirely from Purgatory, While at the same time gaining the greatest graces and blessings. 1) Sufferings come from God for our benefit. 2) When we are in the state of grace, we derive immense merit from every suffering borne patiently, even the little sufferings of our daily lives. 3) God will give us abundant strength to bear our sufferings if we only ask Him. 4) If we bear our sufferings patiently, they lose their sting and bitterness. 5) Above all, every suffering is a share in the Passion of Our Lord. 6) By our sufferings, we can free ourselves in great part, or entirely, from the pains of Purgatory. 7) By bearing our sufferings patiently, we win the glorious crown of martyrdom. Of course, we may do all in our power to avoid or lessen our sufferings, but we cannot avoid all suffering. Therefore, it is clearly necessary for us to learn how to bear them. In a word, we must understand clearly that if we remain calm, serene and patient, suffering loses all its sting, but the moment we get excited, the smallest suffering increases a hundred fold. It is just as if we had a sore arm or leg and rubbed it violently; it would become irritated and painful; whereas, if we touch it gently, we soothe the irritation. We suffer from ill-health, from pains, headaches, rheumatism, arthritis, from accidents, from enemies. We may have financial difficulties. Some suffer for weeks in their homes, some in hospitals or nursing homes. In a word, we are in a vale of tears. Almighty God could have saved us from all suffering, but He did not do so because He knows in His infinite goodness that suffering is good for us. We have a great, great remedy in our hands, that is, prayer. We should pray earnestly and constantly asking God to help us to suffer, to console us. or if it pleases Him. to deliver us from suffering. This is all, all important. We should above all pray to Our Lady of Sorrows in all our troubles. We should ask her, by the oceans of sorrow she felt during the Passion of Our Lord, to help us. God gave her all the immense graces necessary to make her the perfect Mother of God, but He also gave her all the graces, the tenderness, the love necessary to be our most perfect and loving Mother. No mother on earth ever loved a child as Our Blessed Lady loves us. 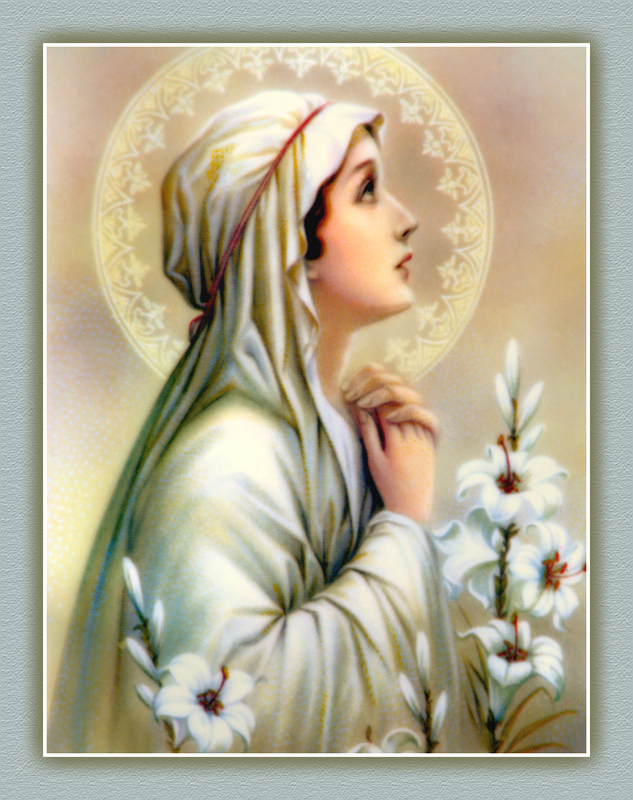 Therefore, in all our troubles and sorrows, let us go to Our Blessed Lady with unbounded confidence. Remember, O most gracious Virgin Mary, that never was it known that anyone who fled to thy protection, implored thy help, or sought thy intercession was left unaided. Inspired with this confidence, I fly unto thee, O Virgin of virgins, my mother. To thee do I come, before thee I kneel, sinful and sorrowful. O Mother of the Word Incarnate, despise not my petitions, but in thy mercy hear and answer them. Amen. This entry was posted in Sermons, Suffering, Uncategorized and tagged Sermon, Suffering on August 30, 2016 by damselofthefaith. The Church got 6 inches of water. 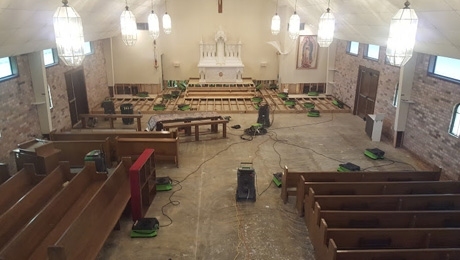 My SSPX parish, Our Lady of Sorrows in Baton Rouge, Louisiana, was significantly damaged in the recent South Louisiana Historic Flood. Please keep us all in your prayers. I have quoted the entire SSPX news article below. I have highlighted and italicized the portion dealing with my family in particular. Out of the 4 families of my parish affected by this flood, we were the only ones with flood insurance, for which we are very thankful. Our parish is strong in faith and devotion. Together we will get through this present trial. My beloved chapel has been the great light in my Catholic life. Therein I’ve received the greatest graces and blessings from the Sacraments, devotions and the sermons and love of our Priest, Fr. Gonzalez. It’s difficult to see it in this condition, but we will restore it and make it more beautiful than ever, with the help of God! I ask your prayers for my fellow traditional Catholics of Our Lady of Sorrows who have lost everything and been so greatly affected, as well as the many thousands in South Louisiana, who have also lost everything to this monumental flood. Thank you. We must never forget that if God allows such an event like this to occur, it is so that a far greater good may come out of it. While some good fruits may not be immediately foreseen and may require the virtue of patience, there is something truly wonderful to be gained right now! As the Damsel and I know, there are many good, dear parishioners at our Louisiana parishes! How we love them all! God is providing us a very special opportunity- if we accept these sufferings with love and perseverance, then we will all become very great saints! We will really and truly love Our Lord Jesus Christ and share in a very special way in his Passion! If it seems especially difficult to properly offer these trials, then we should seek the good love and charity of others and above all, pray! Tell God everything. He knows exactly what we need! All He wants is that we ask with a childlike trust! I am very pleased to see the progress of all of the recovery efforts and personally, those of Our Lady of Sorrows Chapel and of the Damsel’s family home! I know everything will turn out just fine, as is already looking to be the case! Let us keep our trust and good cheer and continue on together! As we follow news of the massive flooding in Louisiana, we focus our attention on a small church and its parishioners who have been affected. With these global numbers in mind, we have been in contact with our two parishes in Louisiana that have been affected, Our Lady of Sorrows in Baton Rouge, and Our Lady of Grace in Kenner (New Orleans). If you attend these parishes, please take note of the new temporary mass times and locations. We have posted them on our chapels pages, as well as at the end of this article. 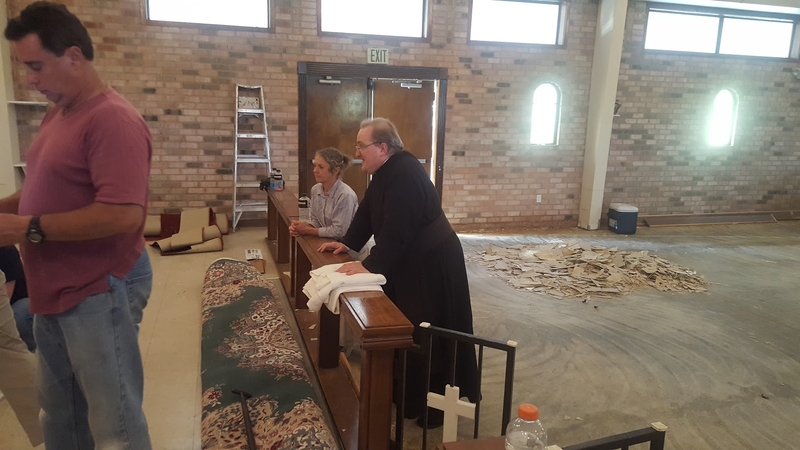 We spoke on the phone with the parish coordinator at Our Lady of Sorrows in Baton Rouge, to get a sense of the conditions on the ground in his town and at our parish. That we know of so far, four of our families’ homes were severely damaged or destroyed. One unfortunate family had five feet of water in their home for almost a week, causing the sheet rock to simply desintegrate. They returned to the awful site of their home’s contents in a massive, mildewed heap, coated in the gypsum board. Our families are, as one would expect, typically large, causing chaos and hardship especially on the children at the start to an academic year. Of our four parishioners who were so greatly impacted, three had no flood insurance – a logical financial choice, given the extraordinarily slim probability (the 500-year time period mentioned above) that a flood would hit their given location. Our fourth family did, thankfully, have coverage, but it seems not for their contents. While here at the District House we have no particulars about their situations, we can only surmise that this act of God will cause a near-total financial loss for these families. In the coming days, we will be setting up guidelines for those who have the means and desire to assist these families, and to hopefully mitigate their hardship. And while financial charity is a necessary thing, we also ask for your spiritual charity, to give these families the strength, resilience, and acceptance to work through this trial – truly not unlike that of Job in the Old Testament. Beyond the parishioners mentioned above, there is almost no one in the town of Baton Rouge who isn’t affected in some way or another. If a family has been fortunate enough to stay in their home, they know 5 other families who are displaced. This flood has been called the “500 Year Flood”, due to its breadth and far-reaching effects. Areas that have never flooded before are under several inches, even feet of water. For this reason, the infrastructure – and even the earth itself – is simply not equipped to handle the massive quantities of water, causing the floodwater to slowly rise and backfill to an even-larger footprint. Families who live near the rivers were struck with the initial flooding as expected, then moved back to repair the damage – but this flood doesn’t just hit once. Water flowing from other areas will arrive a second, or third time, causing extensive damage and even multiple evacuations. To understand the dynamics at play, imagine a baking dish half-filled with water slowly tipping back and forth. The groundwater is acting very similarly in this low-lying state, struggling to find an equillibrium, and flooding as it goes. Beyond this, the water that is flooding most areas is drainage water, backwater, or sewage; not just silty river water. It is in this environment that Our Lady of Sorrows parish found itself, and it was not spared the flood. 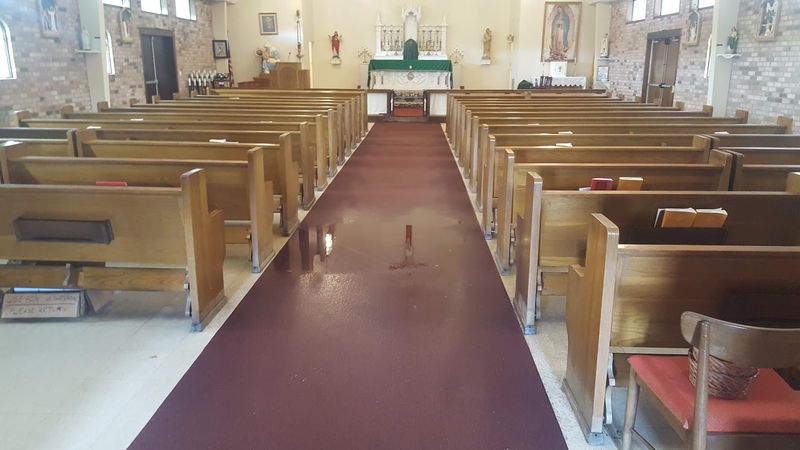 The entire area was closed to traffic, so it was not for several days that parishioners were able to re-enter and see that the water had risen 6 inches into the church. While the exterior and some interior walls are brick, and have remained undamaged, the same cannot be said for the interior. All the flooring has been ripped out, and anything that was below the water level and was not solid wood or metal is destroyed. The carpet runner up to the sanctuary had to be cut into pieces and drug off it was so heavy with saturated water. Sheet rock and paneling has been cut out at the two-foot mark to prevent mold growth. Anything that was stored on the floor has been destroyed, including potentially two pianos and an organ that was mid-repair. A major concern was the more than century-old altar. While it was raised above the floor on three steps as is traditional, the platform’s interior supports and insulation were completely saturated, causing fears that the altar would have to be disassembled and moved – something no one had done in the parish’s memory. Thankfully, the flood’s damage had a bright spot – the ability to easily access the space through the back wall of the sanctuary, via the anterior rooms. In other rooms of the church building, the same damage was experienced. File cabinets for parish records have begun to rust, not to mention the contents inside. The sacristy cabinets and vestment drawers had to be removed or cut. Many of the vestments and other liturgical items were also impacted; even if one cassock was dipping into the water, it would wick up the length of the garment, and soak into other items. Thankfully, these items can be cleaned and the parish anticipates they will be mostly undamaged in the long term. In short, throughout the entirety of this rather large building, measuring 40 by 120 feet, almost everything that was on or near the ground has been destroyed. However, in this damage and desolation, Our Lady provided two bits of consolation to her parish. First, the coordinators were able to call professional cleaning and flood restoration services early enough before they were engaged in other areas, giving the parish a jump start in regards to clean up. Massive professional-grade air movers were just removed today after several days of constant use, the building has been stabilized, and is now mostly dry. Barring another unforseen rise in water, the church has survived its worst. Second, and most importantly, the parish just renewed its insurance, with complete flood coverage. While the claims and adjustment period may yield any result, there is anticipation that the structural repairs and most of the contents will be under the coverage. It is with this sense of consolation in the midst of a tragic circumstance that we request your prayers for our parishes and families, and humbly ask Our Blessed Mother for her continued intercession. This entry was posted in Louisiana Flood, Uncategorized and tagged Louisiana Flood on August 27, 2016 by damselofthefaith. Damsel of the Faith here. Thank you all for your continued prayers. Please keep them up for South Louisiana. This entry was posted in Assumption of Our Lady, Our Lady, Uncategorized and tagged Our Lady on August 24, 2016 by damselofthefaith. Thank you all SO MUCH for your prayers and support! My house got 20 inches of water and most of my belongings are fine. Very happy about my religious items, my clothes and my computer. So many blessings to count. We are fortunate to have flood insurance which will take care of the house. As for appliances and furniture, we’ll have to rely on God and the goodness of others. As there will be much to do, posts from myself will be kept on hold. Please continue to pray for us that our house will be restored and refurbished. Also, for some of the parishioners of Our Lady of Sorrows, SSPX Chapel, in Baton Rouge, some of whom have lost everything, literally. As for the chapel, praise God, it only got 6 inches of water. God is good, of course, to protect His dwelling, His temple, His tabernacle and our only refuge in this disaster. Please pray for my state. I am blessed but for others it’s a disaster like no other. This truly was unprecedented. And for myself, it’s still so unbelievable and catastrophic. This entry was posted in Louisiana Flood and tagged Louisiana Flood on August 17, 2016 by damselofthefaith. This is an utter disgrace of epic proportions, a classic example of how far the human element of the Church has fallen, how much the Faith has been lost and the general apostasy and heresy rampant in the Church. To think that Successors of the Apostles would have lost the Faith to such an extent that they would be praising the founder of the greatest revolution the world has ever seen, the protest and rebellion against God and His Church, would be nothing short of unthinkable 100 years ago. Those who would dare to assert that Martin Luther was a “teacher of the Faith” (!) would be reprimanded and laicized, to say the least. An apostate priest who rejected the teachings and practices of the Catholic Church deserves to be praised, extolled and vindicated? This man began and shaped the Protestant Revolt, whose sole purpose was to rebelliously revolt against the truth of Christ and the Church, in favor of a personal religion based on our own wants and desires, a religion without the cross, without penance for our sins, without all of the Sacraments, without Our Lord Jesus Christ in the Holy Eucharist, without the Blessed Virgin (who is held in disdain by Protestant sects), without everything needed for salvation. Do the German Bishops really wish to teach their faithful that they can sin and sin boldly, since they are assured of their salvation, according to Martin Luther? Do they wish to teach Sola Scriptura? The Church has always taught that Scripture and Tradition go hand in hand, both containing the truth. You know, it’s funny that these modern Bishops wish to praise an excommunicated heretic, yet if we praise the “excommunicated” Archbishop Marcel Lefebvre, (the Bishop solely responsible for saving the Catholic Faith, the Catholic Priesthood and the Mass of All Time), we are condemned for this and Archbishop Lefebvre is condemned as an excommunicated heretic, for not adhering to their new religion. Archbishop Lefebvre was “excommunicated” from their liberal religion (rightfully so!). Martin Luther is a saint of their liberal religion since he embodies heresy, error and Modernism, at its best. If these Bishops understood the Church and her role truly, they would be doing all in their power to lead every soul in the world to the One True Church of Christ for their salvation. But, Our Lord and His Church has been placed on par with the heresy of Martin Luther’s Protestantism, to the detriment of souls and the shame of those consecrated to pass on the Catholic Faith. I have said it before and I will say it again: The German Bishops follow their master, Luther. “Hence by God’s eternal decree the salvation of all men, both severally and collectively, depends upon Jesus Christ. Those who abandon Him become guilty by the very fact, in their blindness and folly, of their own ruin; whilst at the same time they do all that in them lies to bring about a violent reaction of mankind in the direction of that mass of evils and miseries from which the Redeemer in His mercy had freed them. Those who go astray from the road wander far from the goal they aim at. Similarly, if the pure and true light of truth be rejected, men’s minds must necessarily be darkened and their souls deceived by deplorably false ideas. What hope of salvation can they have who abandon the very principle and fountain of life? Christ alone is the Way, the Truth and the Life (John xiv., 6). If He be abandoned the three necessary conditions of salvation are removed.” ~Pope Leo XIII, “Tametsi Futura Prospicientibus”, 1900 A.D. This entry was posted in Church crisis, Protestantism, Uncategorized and tagged Crisis in the Church, Protestantism on August 13, 2016 by damselofthefaith. 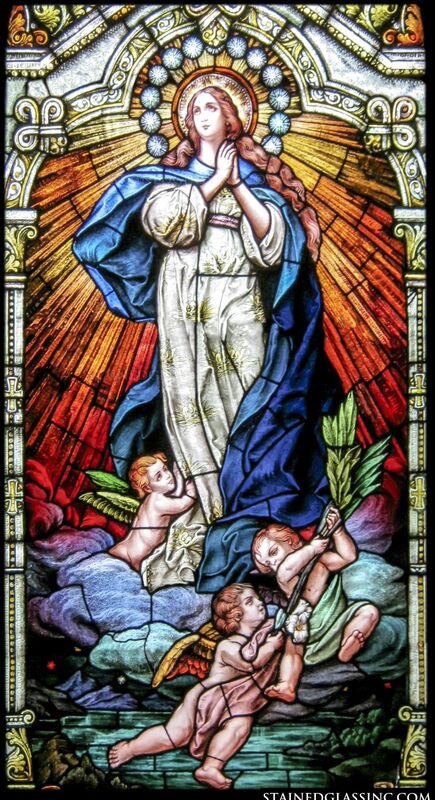 Peace will only be given to the Church and the world through the maternal intercession of Our Lady and the love of Her Immaculate Heart. The Church must proclaim the vital importance of the Immaculate Heart in the salvation and sanctification of mankind by consecrating Russia to Her Immaculate Heart for world peace. “And you, Venerable Brethren, – the more you have at heart the honor of Mary, and the welfare of human society, the more diligently apply yourselves to nourish the piety of the people towards the great Virgin, and to increase their confidence in her. We believe it to be part of the designs of Providence that, in these times of trial for the Church, the ancient devotion to the august Virgin should live and flourish amid the greatest part of the Christian world. May now the Christian nations, excited by Our exhortations, and inflamed by your appeals, seek the protection of Mary with an ardor growing greater day by day; let them cling more and more to the practice of the Rosary, to that devotion which our ancestors were in the habit of practicing, not only as an ever-ready remedy for their misfortunes, but as a whole badge of Christian piety. The heavenly Patroness of the human race will receive with joy these prayers and supplications, and will easily obtain that the good shall grow in virtue, and that the erring should return to salvation and repent; and that God who is the avenger of crime, moved to mercy and pity may deliver Christendom and civil society from all dangers, and restore to them peace so much desired.” ~Pope Leo XIII, “Supremi Apostolatus Officio”, 1883 A.D. This entry was posted in Our Lady, Quotes from the Saints and tagged Our Lady, Quotes from the Saints on August 11, 2016 by damselofthefaith. During this Month of the Immaculate Heart of Mary, make reparation to Our Lady’s Immaculate Heart for the outrages and sacrileges committed against that Most Blessed and Pure of all Hearts. How do I grieve, O holy and spotless Virgin, when I reflect on the insults thou hast received, and still receivest every day from the malice and ingratitude of men! Thou hast been outraged by heretics, and insulted by bad Catholics: how could any heart have been so hard and impious? Alas! even some Catholics are cold and indifferent towards thee, and do not in the least endeavour to show thee their love and gratitude, neglecting to honour or invoke thee, or to deserve thy protection. I myself have many times afflicted thee, most holy Virgin, by offending thy Divine Son, Whom thou lovest a thousand times more than thyself: my sins have pierced thy heart with a two-edged sword! What return have I made, what gratitude have I shown for all thy goodness to me, my beloved Mother? How have I tried to imitate thee, or what zeal have I felt for thy service? Mother of mercy, I should not dare to lift up my eyes to thee, if thou wert not the Refuge of sinners: oppressed by the weight of my crimes I cast myself at thy feet, to implore thy pardon for my ingratitude, and for that of all mankind, Mother of sorrows, who wert appointed our Mother on Mount Calvary, I implore thee to forget our past conduct, which I most earnestly wish to atone for, as far as possible. I offer thee my homage and praise, and I profess aloud my conviction that thy glory exceeds that of all creatures; with the Church I revere thy immaculate conception and thy glorious assumption; I believe that thy power and thy perfection are such as suit thy dignity of Mother of God; I joyfully acknowledge thee for my mother, my Advocate, and my Refuge; and as long as I live I will be among the most devoted of thy children, and will endeavour to win souls to thy love. Most holy Mother be pleased to accept my desires; bless and protect them, that so, by copying thy virtues, I may deserve to see thee in Heaven for all Eternity. Amen. O Immaculate Heart of Mary, I have nothing in myself to offer thee that is worthy of thee; but what thanks ought I not to pay thee, for all the favours which thou hast obtained for me from the Heart of Jesus! What reparation ought I not to make thee for all my tepidity in thy service! I desire to return thee love for love; the only good that I possess is the sacred Heart of Jesus, which thou thyself hast given me. I offer thee this treasure of infinite price; I cannot do more, and thou dost not deserve less at my hands; but, receiving from me this gift most precious in thy sight, be pleased, I beseech thee, to accept my heart, which I here offer to thee, and I shall be for ever blessed. Amen. This entry was posted in Immaculate Heart, Our Lady, Uncategorized and tagged Our Lady on August 9, 2016 by damselofthefaith.